We came home today to a delivery of Wii’s new Birthday Party Bash for about an hour now and it is the perfect set of mini games for preschoolers and young elementary kids. The idea is to buy the game and host a birthday party (up to 12 players can play.) The host can select from 10 themes (we like “Monster Party”) and the party is then matched with about 10 games (of over 20 party games) to play during the party. Or you can create your custom party with your favorite games. It even comes with birthday party invitations–all you need is 4 remotes and a real cake and you’re set. « Baby’s a Toy Tester! (aren’t they all?) Dress him cutely and keep those toys clean! 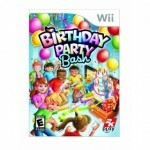 So how does Wii Birthday Bash compare to Wii Fit and the new Wii Sports for little kids (6yo)? I haven’t seen much advertising for this game – who makes it? My kids are total Wii addicts!